Our 2018 Annual report is ready for reading! Thanks to our wonderful volunteer Walt at Stand Christchurch, we will very shortly have a chess board. The children await with eager anticipation! Team Taha conquered the maunga on Tuesday - from Poho right to the top. 30 seconds into it and there was complaining of sore legs but both boys showed resilience and smashed it. The kids in Christchurch have been making their own tie-dye shirts, beautiful stuff! You might not know that each of our villages has a complete school to work with the kids on their education when they're with us. 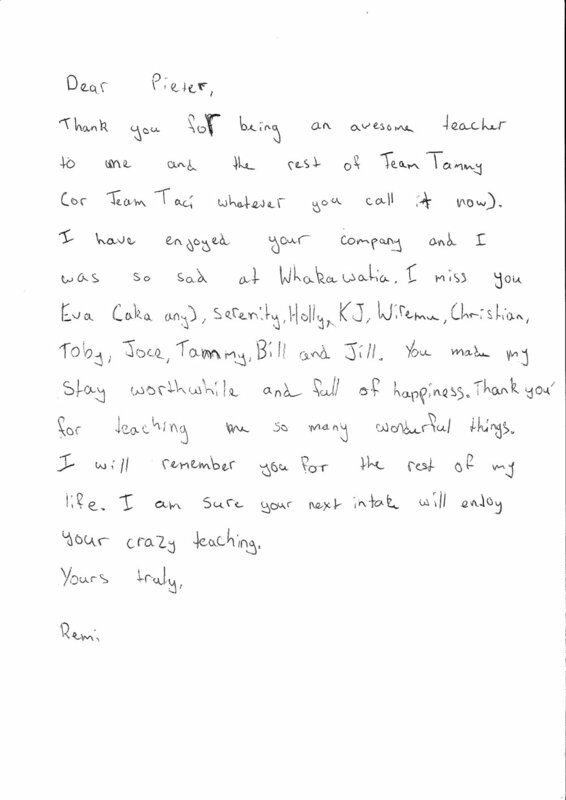 This kind of letter makes it all worthwhile. The children from Midland’s Intake #1 (with a little bit of help from the Therapeutic Care and Education team) have made these four beautiful, huge murals to brighten up our walls in the village. Aren’t they spectacular? Frost on the boardwalk, snow on mountains, fog in the valley, early morning sunshine... stunning morning. Our residential services in Otaki and Roxburgh have now shut down operations. Our community social workers are still working from these locations and will continue to help and engage with our families in need, but the rooms and corridors that have echoed with the sounds of children's laughter for decades are now silent. What does a gym for kids need? Basketball hoops! The Christchurch children's village has a fantastic internal gym space but was missing a crucial ingredient - basketball hoops! Thanks to those wonderful people at the Glenelg Trust we received funding to install some. The funding also enabled us to procure a height adjustable system which means the little ones have a fair shot too. The kids are having a ball! The scientific evidence for keeping young people out of prison was clear 20 years ago, but not enough has been done. A new report from the Chief Science Advisor's Office wants the government to focus on very young children and their families to reduce rates of youth crime. The Prime Minister's science adviser for the Justice sector, Ian Lambie, who is the author of the report, talks to Susie Ferguson. With help from Stand Youth Worker in Seconday Schools services, funding and advocacy, students at Dargaville High School are now wearing Tupenu / Sulu va tonga/ Le Faitaga as part of their school uniform for both informal and formal use. The school had included this as their part of new uniform going into 2018, but had yet to source the required garments. YWiSS services enabled students to find a supplier, get the required garments approved, order them, and start wearing them to school. This created a diverse uniform option that has become popular for both Polynesian and non Polynesian students. The Otago Daily Times has run an article that provides some Q+A around the village closures. Reporter Pam Jones takes some of the questions from the Southern mayors and poses them to CEO Dr. Fiona Inkpen. "I do fear that my son will go back into his isolated state that he was"
TVNZ had an article last night on the closures and the mother of a child attending the village was able to have a say. Stand Children's Services is to close its Children’s Villages at Otaki and Roxburgh. Some good news in, staff at our Welfare agencies being given the backing from the top to help, not hinder, people coming to them for assistance.